Are you a cake lover? Yes, majority of us are. Cakes are much more than a dessert. They are a symbol of celebration and joy. 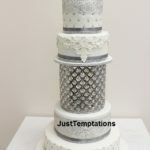 At Just Temptations, we are your local cake shop in Markham that bakes tasty, fresh and custom wedding cakes. To make your big day turn into a bigger one, we deliver amazing cake designs that compliment your wedding theme. If you are planning to surprise your loved one on his birthday, we are here to prepare a delicious birthday cake that will surely amaze him/her. We are expert bakers who combine the right blend of colors and ingredients to deliver you the best flavor and essence. Just Temptations caters buttermilk, chocolate, strawberry, vanilla, blueberry, pineapple etc. flavored fountain cakes and cupcakes in Milton. 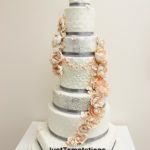 Just Temptations has emerged as a popular cake bakery in Markham from the past few years. 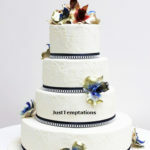 Our bakers strive to deliver custom wedding cakes made from the finest quality ingredients. With so many designs and flavor choices, you can pick your favorite delight from our hand crafted showstoppers. 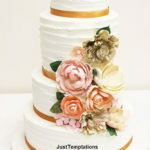 Being your local bakers in Markham, we bake and deliver fresh cakes for your special occasion. With utmost care, attention and perfection, our master pastry chefs make sure that every slice of the cake you ordered surpasses the level of perfection. Customers are our most valuable assets and we work hard to satisfy them. Call us today to discuss your custom cake design needs.